Whenever users are trying to make quite easy and rapid cross line alignment at a quite long work distance, it would be an extremely hard work until selecting a practically used laser device. For instance, on basis of basic import 445nm blue laser diode tech, laser tech engineer has just designed this cross laser alignment tool with advanced glass coated lens. It is getting selectable output power and optic lens degree, even though cross line targeting is processed at quite long distance, this blue laser module is just effective enough to obtain highly clear and accurate blue cross line generation in use effectively. Usually blue crosshair laser module is employing import 445nm blue laser diode as its laser beam emitting source. Owing to its beginning high power from 50mW to 100mW, it is always generating highly clear and visible blue laser beam at several miles far away. It is an industrial stabilized alignment laser device, once it is being used by skilled users or professionals, it would just make sure of highly stable and reliable performance, and then maintaining clear blue cross line generation in long term use. In quite special work field, such as laser show, laser displaying or military targeting, high power blue crosshair laser module might be used under those of harsh working occasions. However, it is just being manufactured with high attention to environmental stabilization. It is just employing quite high quality aircraft used aluminum alloy housing material, together with copper made laser diode core part, this blue cross laser alignment is obtaining highly stable cross line generation within wide range operating temperature. After quite easy installation and adjustment of cross line targeting direction, it is just keeping highly stable performance, without any affect caused by mechanical shocking, calibration or moving etc. Anytime cross line generation is proceed under multiple working environments, this compact structure made blue crosshair laser module is always workable with quite easy installation, adjustment, and then obtaining highly stable cross line generation in any working occasion. With the assistance of a laser alignment mounting bracket, noncontact blue cross line source is taking quite low time consumption and reduced relying on professional skills, and then easily achieving highly clear blue cross line projection in distance. Only according to proper wearing of 445nm wavelength preventing laser safety goggles, this high power blue laser module would just make sure of highly secured measurement constantly. In those of precise device manufacturing work fields, such as screen printing system or heat transfer machine works, it would be a quite hard work for users to get quite accurate cross line targeting result in distance. Under condition that formal cross line drawing device, such as triangular meter or blocking board is substituted with quite advanced economy red cross laser alignment, it is always effective enough to gain constant and highly accurate red vertical and horizontal laser lines with accurate 90 degrees. After proper selection of output power and glass coated lens, this 650nm red laser module is just making no mistake measurement perfectly. When cross line targeting is processed on different targeting surfaces, it is always required to generate different line length and line thickness in use. It is getting the use of quite high quality glass coated lens with selectable optic lens degree of 10, 15 and 110 degree, and then generating different cross line length in distance. In order to make sure of super clear cross line generation in quite complex working environments, it is just getting special design of glass window in front of laser beam aperture. In special work fields, such as moisture and dust working condition, this cross line laser module is able to work with super nice performance and good laser light cycling use. According to a series of quite strict tests, such as up to 24 hours aging preventing test, alternative high and low temperature changing test, and super rapid electric current adding, economy red cross laser alignment is always bearing various harsh working environments, and then maintaining highly stable cross line generation in long term use. In addition, according to the use of DC input power supply, this red cross line laser gets larger space reserving as its cooling system, and always making sure of highly stable cross line targeting in long term use. It is just bearing quite harsh occasion, such as strong interference or strong static etc. Whatever kind of targeting surface, economy red cross laser alignment is always workable as an accessory part, after quite easy installation with a laser alignment mounting bracket, it is able to be installed on any other device and equipment, and then getting the clearest cross line generation in distance. Usually noncontact red cross line laser source is allowing adjustment within three dimensions, and then getting the easiest measurement in all work fields. Under condition that users are wearing proper laser safety goggles and adjust it on correct position, it will make the most accurate measurement perfectly. The operation of blue crosshair laser module always begins with high output power range 445nm blue laser diode. Once it gets direct laser beam emission and qualified two perpendicular lines positioning from glass cylindrical lens, it is just efficient enough to get clearly visible vertical and horizontal lines with different dimension. When users are getting very easy installation and adjustment of cross line targeting direction and laser beam focus, this cross laser alignment is always getting superior accurate instruction for all kinds of high tech and industrial machinery processing works. The generating blue laser beam from blue crosshair laser module is not as bright as 473nm blue DPSS laser system. However, even though 445nm blue laser diode gets much higher output power range from 50mW to 100mW, it is still efficient enough to be designed and manufactured with quite compact size 16mm diameter tube laser module. In practical cross line targeting work, this cross line laser module is very easy and convenient to operate and install, easily achieve precise enough blue cross line positioning result efficiently. 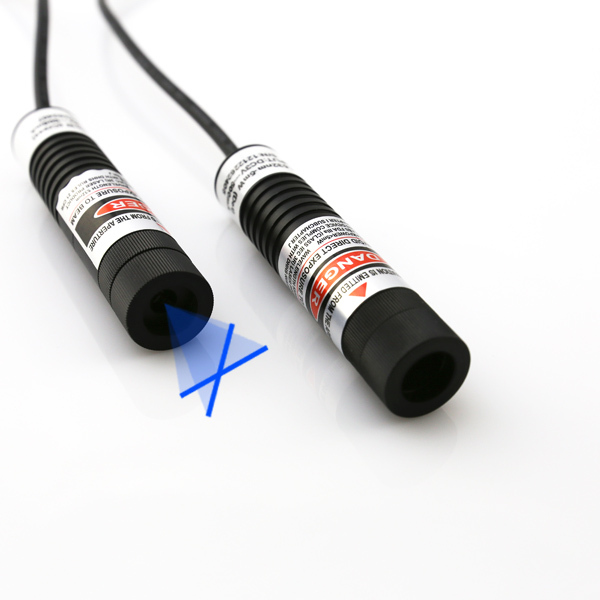 For the most important of all, when cross line laser source is pointed from 445nm blue laser diode, this direct diode emission blue crosshair laser module is able to support even longer time work. On consideration of its high output power range, laser tech engineer has not simply limited for simple presentation performance, this cross line laser just gets the most advanced APC, ACC electric driving circuit design. The intelligent feedback system provides constant electric current supply for the internal part of 445nm blue laser diode and electric current board. 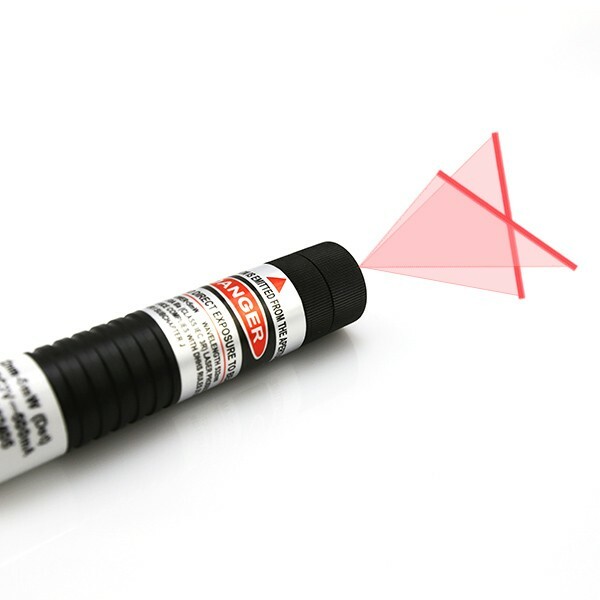 Blue crosshair laser module is always efficient enough to keep highly stable two perpendicular lines alignment on all desired working surfaces. This is not a very simple dot projecting tool, but mainly workable for all kinds of industrial precise machinery processing works. The application of higher operating voltage of 4.2V DC input power supply has just ensured its bright cross line source targeting, but also making sure of superior protection of cross line laser module from any type of strong interference and statistic etc. This durable structure blue crosshair laser module employs quite compact structure design, with selectable laser tube diameter of 16mm. It can be easily installed on any device, such as screen printing system, heat transfer machine, laser medical treatment device or military targeting device etc. Users should also seek help from laser alignment mounting bracket and safety measure from a pair of 445nm wavelength preventing laser safety goggles.